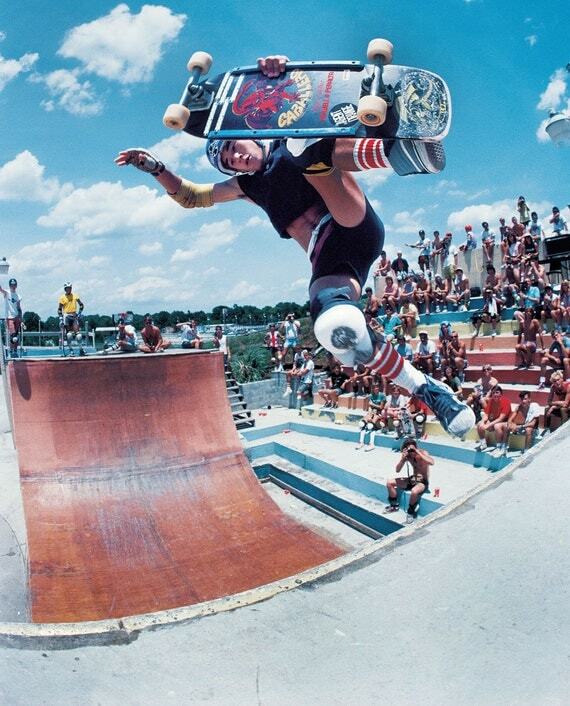 Today we’re time travelling to a place where skate shorts and mullets were not only acceptable, but pretty desirable - the 1980s shred scene. Does any of that stuff have a place in our park now? Any discerning ripper of the 80s used ‘Rip Grip’ to stay in control. This stuff fixed securely to the nose of your board and could actually come in handy to keep a handle on those backside airs after a whole bucket of Skate Fry Days chicken. You can still get hold of the Alva finger grip on eBay pretty cheaply. Thank us later! The main benefit of board, or 'slide rails', was a smooth ride on your boardslides and something to get a hold of when trying our Hosoi-style manoeuvres. Aside from that, they keep your Caballero graphics pretty pristine if you're board-erline OCD. In fact, Cabbie still reps the Powell Peralta Rib Bone. Probably time we put these to the test in our new street section on May 4th, no? Soft pads called Risers were designed to absorb vibrations on rough terrain and increase wheel clearance, as well as stopping board breakage. These things are still readily available in a range of heights and can be used on new skool, old skool and longboards. Gimmick alert! Popular with kids and big kids alike, this contraption stuck with adhesive to the back of your board to ensure sparks flew even if your tricks didn't. A few minor issues - the first is that it's a fire hazard (so you can't do it in our tunnels, you'd need to take it to the streets), the second is that it only really worked twice and then it's stuck to your board forever. Lappers did exactly what they said on the tin, 'lap' your truck back in over coping, curbs, car park wheel stops or whatever else was in the way of victory. They pretty much became obsolete when the nose became the same length as the tail. So maybe, if you wanna ride an old skool deck, invest in a lapper to ride around our bowl and flip someone the bird.